the passenger through. According to the research report, eGates are ahead of kiosks in terms of market value and growth rate. eGates are expected to hold a market value of US$ 1,800 Mn by the end of 2026, growing at a CAGR of 20.1% during the forecast period. The factor that is helping the growth of eGates is its ability to provide assistance without any supervision. Whereas, in the case of Kiosks, traveler still has to speak to a border control officer for a final check. With the increase in air travelling and number of passengers, airports have to handle a lot of passengers at a time. The increase in air travel is a result of factors like increase in the number of people traveling abroad for higher education and career opportunities, decrease in the cost of air travel, increase in the mobility of people, and rising wealth of HNWI (high-net-worth individual) individuals Other factors such as advancements in infrastructure in developing countries, and growth in the number of domestic and international airports are significant factors driving the growth of the automated border control market. It also includes a rise in the number of corporate travelers. The Global Business Travel Association (GBTA) estimates that, US$ 1.25 trillion was spent on corporate travel, worldwide, in 2015 – an increase of 6.5% on 2014 levels. The underdeveloped or developing regions do not have efficient manpower of skilled labor to operate technologies like automated border control systems. The e-Gates and kiosks used to maintain border security require a group of trained people who can handle the security infrastructure in case of failure in passport scanning, biometric algorithms, problems during scanning of documents, database processing, or any other technical issue. Technical skills are also required to maintain data security and prevent intruders from hacking the database. The technology is also extra costly for some regions or economies. These devices are manufactured by the integration of various hardware and software components, such as passport scanners, biometric identification devices such as facial and iris scanners, software for verifying documents with stored databases, custom check software, and others. Each of these hardware and software are individually very expensive, and thus, an integrated system is available at a high cost. 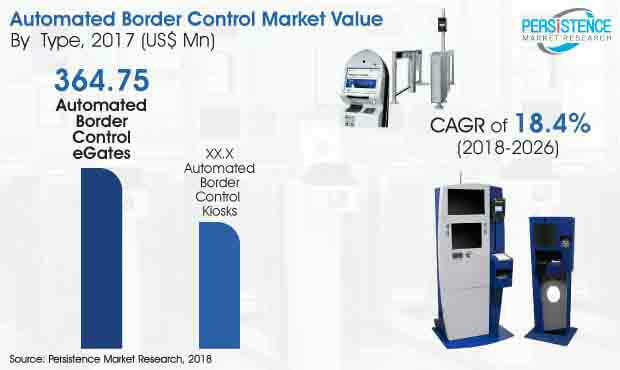 This factor stands as the biggest hurdle in the growth of automated border control market globally.